Often referred to as the “grey ghost” because of the distinctive color of its short, sleek coat, the Weimaraner is a graceful dog with aristocratic features. Bred for speed, good scenting ability, courage and intelligence, he remains an excellent game hunter and active participant in other dog sports. Originally known as the Weimer Pointer (derived from the court that sponsored the breed), the Weimaraner is a product of selective German breeding and comes from the same general stock as other German hunting breeds. It is believed to be a descendant of the Bloodhound and was originally used to hunt wolves, deer and bear. Over the years because of the rarity of bigger game in his surroundings, the Weimaraner adapted to become a bird dog and personal hunting companion. 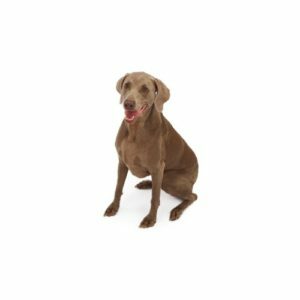 Lauded for his ability to work with great speed, fearlessness and endurance when on the hunt, the Weimaraner is also known for being an easily trainable, friendly and obedient member of the family. This is a breed that loves children and enjoys being part of his family’s “pack.” Grooming maintenance is low due to his short coat. Sporting Group; AKC recognized in 1943. Average size: 23 to 27 inches tall at the shoulder. Are you interested in purchasing a Weimaramer?